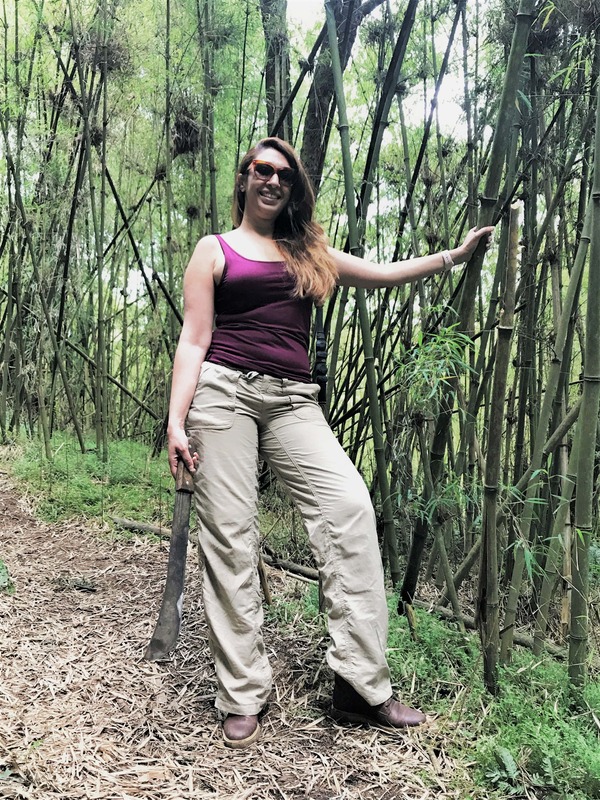 Yes I went for Gorilla Trekking in Rwanda, and it really was uncomfortably close. But before I share the details of my uncomfortable closeness with these misrepresented and misunderstood gentle giants, I have to share the story of how these beings became so important to Rwanda, the world and now to me. The story of gorillas and their conservation is incomplete without talking about Dian Fossey. 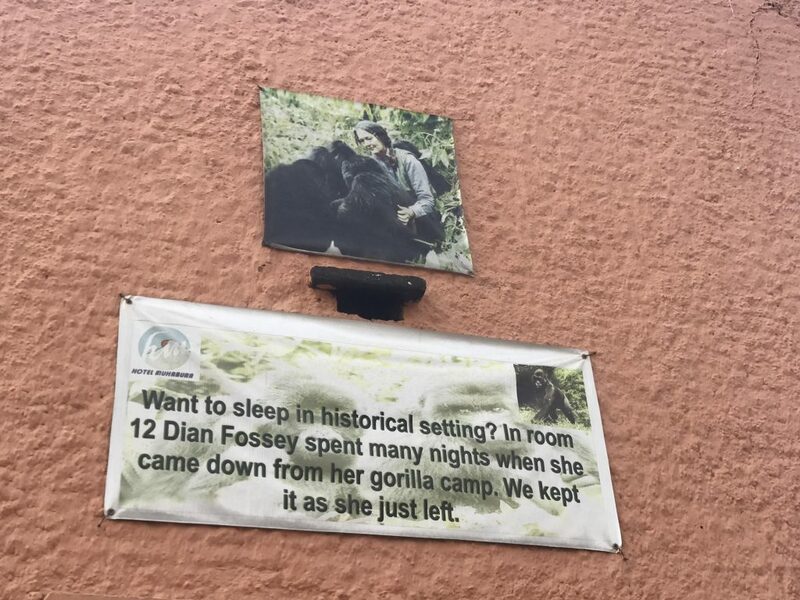 Dian Fossey is a name that will forever be linked to the mountain gorillas. She gave her entire life to the research and conservation of the mountain gorillas and was killed cruelly on Dec 27th 1985. She moved to Rwanda and set up the Karisoke Research center in 1967 with 2 tents in the Virunga Mountains. She gained proximity to the gorillas often by Knuckle walking and chewing celery while around them. And as years went by, the otherwise human shy gorillas allowed her to co-exist. She was able to observe and research 4 gorilla families and named most of them. One of the legends who Dian Fossey had named was Cantsbee. The famous Silverback from the Pablo group. He got his name cause, till his birth, Dian had thought his mother was actually a male gorilla… so obviously when he was born… she said “it can’t be” and hence the name 😊 Cantsbee grew up to be the longest living Gorilla with the largest group ever; he grew up to the age of 38 and had almost 65 members in his group. Cantsbee had disappeared in 2016 and was presumed dead by all, and then miraculously reappeared with his group 3 months later.. living upto the legend of his name… “Cantsbee”. 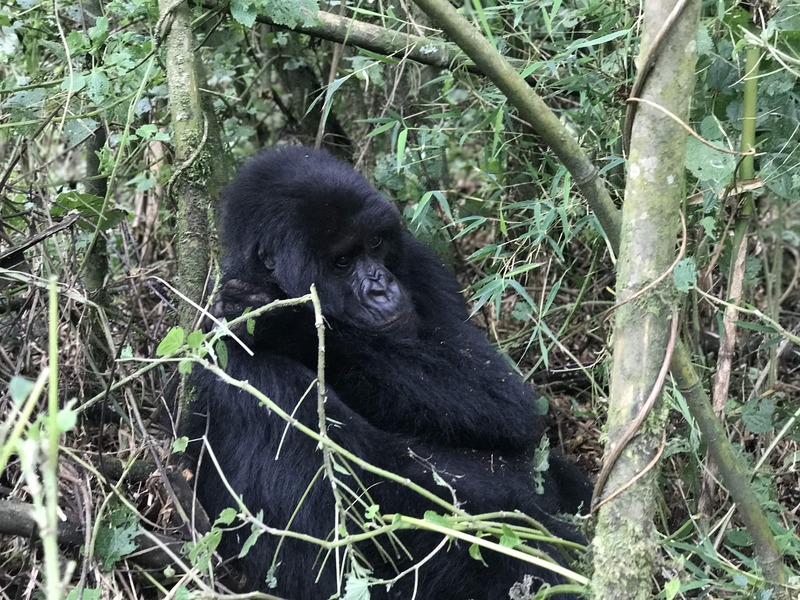 There are 2 reasons for sharing this story; one.. he and his mate Poppy are the last 2 mountain gorillas to be named by Dian Fossey, and the second reason is.. I was lucky enough to be trekking to meet the Pablo group. According to Dr. Tara Stoinsky; Pablo group has now split into 4 groups and Cantsbee’s brother is now leading the group. 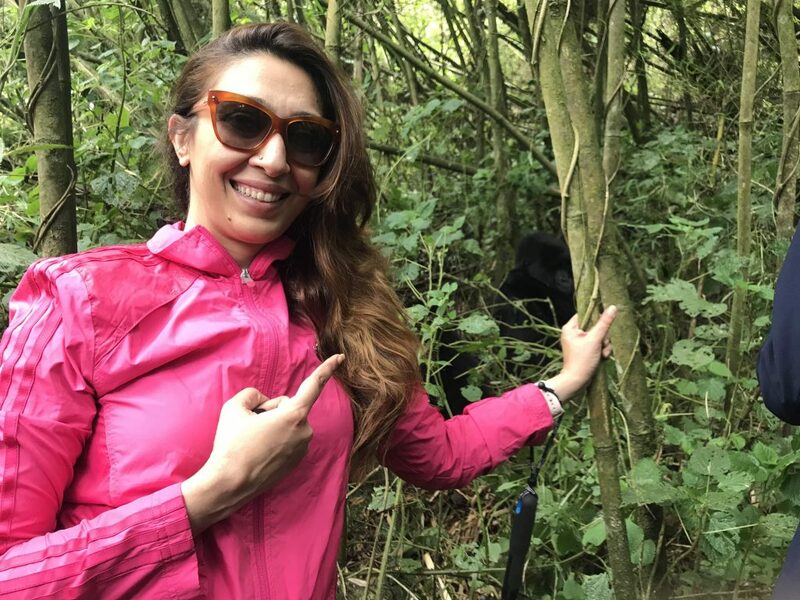 So here I was, prepared… (atleast according to me) to trek up the mountain to see the mountain gorillas and with a million images of how close I may get to be to them… and secretly praying for an intense experience… SPOILER ALERT!! All my dreams came true.. and then some. Charlette from my group had done such treks many times before and had pre-briefed us on the bus. She stressed on being well covered, layered with clothes as it could get cold and even wear gloves! I have a pretty high tolerance for cold and assumed I could handle it with my bright pink wind cheater and I had my cargo pants and timberland boots… I was definitely well equipped. Next she insisted on carrying water and explained the existence and role of porters. So porters essentially were men from the neighboring village who would carry all your stuff for you while you trekked. I personally wasn’t comfy with the idea so decided to split the porter cost with Suresh; a lovely friend I made who taught me photography. 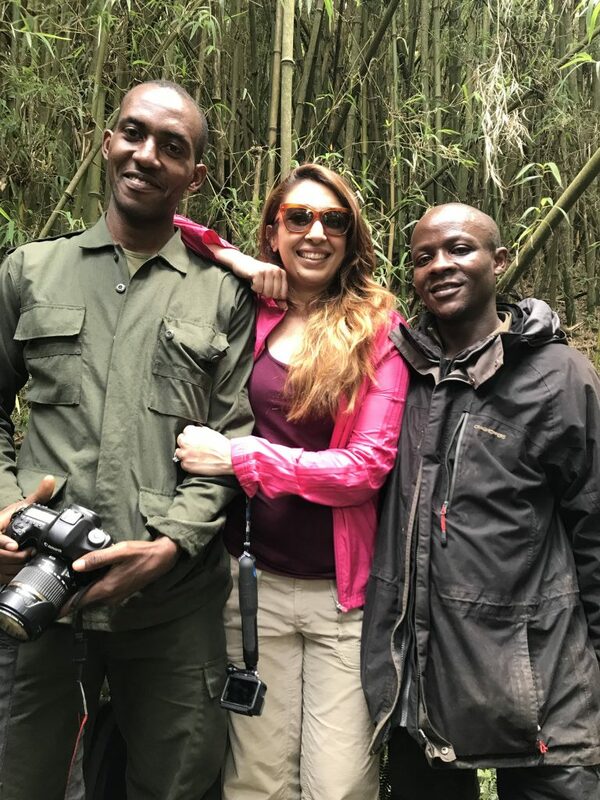 My guide was a tall handsome man called Patrick who spoke really well and his passion for Gorillas was absolutely evident by all the stories he shared with us. Patrick took another briefing and even shared the sounds the gorillas make. He warned us to always keep clear of the path between a baby and his mother and lastly if the gorilla made the sound O..OO…OOO.. OOOO.. OOOOO… OOOOOO… OOOOOOO.. and started to charge towards you.. just duck and sit down in a fetal position. That’s the attacking sound! He further explained that if we did hire the porters; we would be helping the community. So 3 of us from the group with major equipment decided to do our bit for the community and hired the porters. Best decision! Now you all know I have a fractured spine and rods in my right leg right… so even though I should avoid trekking.. I can never let go of an opportunity to look at nature a little more up close and personal. The trek is hard! The mountain is steep! My consolation was that 20 year olds in my group were as breathless as me and all of us were needing a 4 minute break after every 10 minutes of treacherous walk; and also that in just a bit more… I’d be seeing Gorillas. The Pablo family! Patrick kept giving us an idea of how far we were… except what he was telling us was the location of where we could take a proper break and then the Trackers would join us and lead us into the forest to the exact location of the gorillas. I think we had been walking for hours when we reached a meeting point of sorts. This is where Patrick asked us to leave all our belongings with the porters and we were gonna enter into the thick of the forest. We met the trackers there. Now the trackers are a team of men who stay attached to a family from morning till night everyday. They; as the name suggests track each member of that family and also protect them from any poachers everyday. Our tracker appeared with a machete in his hand. I had actually become excited cause it felt like Hollywoood and Nat-Geo kind of gorilla trekking with machetes in a forest! I’m such a fool! It wasn’t even 10 meters into the real forest that I realized why Charlette had insisted we were fully covered and wore layers of clothes and gloves! It wasn’t the climate.. uh..uhhhh! The worst part of the entire trek till then were Nettles, a plant which has the finest thorns and once they touch you… it is a minimum of 20 minutes of intense itch. The thing is… there’s just too many of them and they are touching you all over from your legs to your thighs, to your arms and hands.. oh my god my hands…. My bare bare hands!!! Within moments I wasn’t just itchy but in agonizing pain. I was physically trembling in pain. We had been asked by Patrick not to speak loudly.. so I screamed in my whisper and asked Patrick if he had any medicine for the pain and itch… all he said was “Oh so sorry! No there is nothing but don’t scratch, it’ll get worse. It will get ok in 20 minutes.” 20 minutes… 20 minutes? … 20 MINUTES… I felt like I was going to collapse and yet.. still trekking through the most dense bamboo forest, ensuring I don’t slip on the steep mountain where the ground is slippery due to rain and wet leaves and broken bamboo, going over and under the most abstractly laying bamboo trees and trying (and totally failing) to avoid more bites from nettles. This wasn’t gorilla trekking.. this was Nettle dodging. 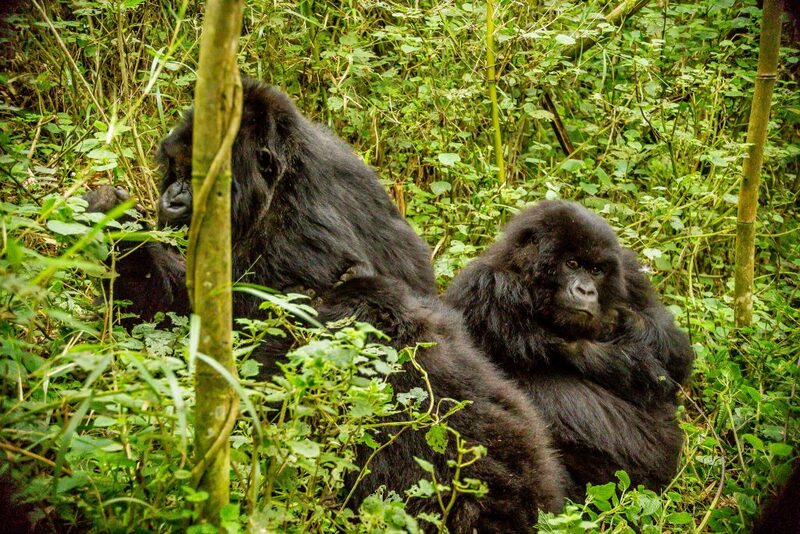 This was a Gorilla trek.. we were tracking Gorillas.. we were in their house.. and because they don’t have a fixed address.. there was no road! You get it!? No path what so ever… That’s what the machetes were for… cutting through the bamboos and nettles to make (not really) a path kind of thing to lead us to them. It sure was hard and I think the first 5 minutes felt like hours already and while I tried to focus on not falling to distract myself from the pain.. just like that.. Patrick asked us to look left.. and just.. there they were.. I saw my first Gorilla. A playful one and about 10 meters away from us. All of us got our cameras out but the dense plantation made it impossible to get a good picture. He was like a black blur moving in the forest. But just a few more steps.. and I forgot my pain… we saw a mother with her baby.. she was feeding him and nursing him and three more young ones were being all playful around her. The fact that we were surrounded on all sides by this family was surreal. 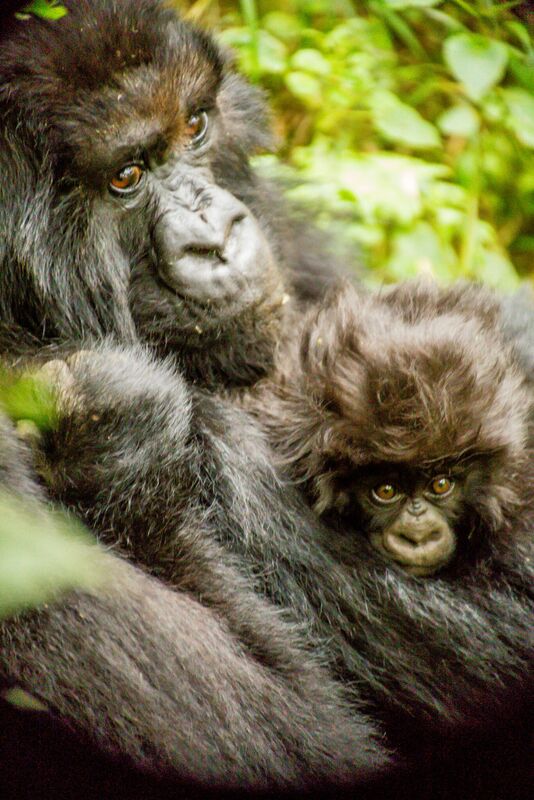 I was in Rwanda, Gorilla trekking and had tracked the most popular family. And no they weren’t 10 meters away.. they were barely 5 or 6 meters away from all of us. Try and imagine this.. no cages, no bars, no windows between us. The whole moment was breathtaking and we all were going crazy with our cameras. Patrick warned us to ensure we were never in the path of any baby towards his mother and we all sincerely obeyed. I did try and capture some pics but was honestly lost in the moment and also very very alert so I don’t make a mistake and offend the gentle giants in any way. Cause they were close.. pretty close.. uncomfortably close and outnumbered us too!